This is one of the more exciting articles that I have written, as it’s a deck that I wasn’t quite sure if everything would come together to make it relevant, but from the testing I’ve been doing with this deck, all signs are indicating to the deck being legitimate, so I’m happy to re-introduce Shiftry FLF to the competitive scene. 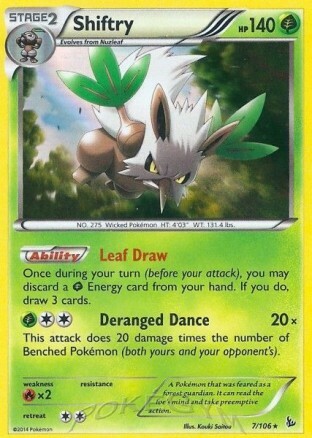 When Flash Fire was first coming out, I ranked Shiftry as my third favorite Pokemon card in the set. It’s a pretty special card in terms of having a great Ability as well as a very strong attack. Leaf Draw lets you discard a Grass Energy from your hand and draw three cards, which gives the deck extra draw power which gives it much better consistency than your average Stage 2 deck. Its attack is great, doing 20 damage times the number of Pokemon on both players bench. You can get it to a base damage of 100 just based on your own Pokemon, and if your opponent has even a shallow bench of two Pokemon, 170 HP EX’s are then in danger of a OHKO if you have a Silver Bangle on Shiftry. The last thing that really sets Shiftry apart from other Stage 2’s is that it is a Grass type, and it uses Grass Energy to fulfill part of its attack cost. The main offender in the prevention of playable Stage 2 decks is Seismitoad EX’s quick item lock with Quaking Punch, but being a Grass type allows Shiftry to easily OHKO a Seismitoad EX if you can evolve through Nuzleaf to get one setup, but more importantly, since you’re already playing Grass Energy, you can easily tech in some Basic Grass Pokemon to serve as a harder counter to Seismitoad EX, allowing the deck to be played even in meta games where Seismitoad EX sees play, which should be most of them. The first go ahead at deck building attempts with Shiftry were centered around Milotic’s Energy Grace Ability to accelerate Grass Energy, as it does take two attachments to get a Shiftry going, so some form of Energy acceleration is needed to keep things flowing. This deck was functional, but Milotic sacrificing prizes to your opponent served in the amplification of the feeling that the deck was too slow, as you would take a little bit longer to get setup just based on being a Stage 2 deck. Being slower to setup than your opponent is fine, but being slower and giving up free prizes is troublesome, and really held the deck back. The deck did lose Tropical Beach, which hurts its setup consistency some, but it also has gained some nice new assets from Furious Fists and Phantom Forces that helps boost the deck’s strength. Let’s not waste any time and go ahead and look at the deck skeleton for Shiftry, so we can talk about what the new take on Shiftry entails. This gives us a skeleton list of 52 cards. First, let me explain my outlook when presenting the skeleton list. What I wanted to do with the skeleton is strip the deck down to its bare contents as much as possible just to discuss the main strategy behind it, but I left cards such as Professors Letter and Silver Bangle in the skeleton, both of which theoretically could be stripped and the deck could still function, but that I left in because of their importance to the deck’s strategy. First off, the deck played a 4-2-4 Shiftry line. Shiftry is your main attacker in the deck and also part of your draw engine, so maximizing consistency in getting Shiftry setup is of high importance. 4 Ultra Ball and 4 Rare Candy are played to maximize the consistency in getting Shiftry out and onto the field. Once you get a single Shiftry on the field, things can start to fall into place very quickly as you gain access to Leaf Draw, which ultimately lets you get setup faster and more consistently as you see more cards per a turn, which in turn lets you see more of the cards you need per a turn. The main partner for Shiftry in this deck is Landorus from Furious Fists. This card serves as your Energy acceleration, and means of getting ahead on Energy attachments. Its Shout of Power attack does 20 damage, and lets you attach a Basic Energy from your discard pile to one of your benched Pokemon. This has great synergy with Shiftry, as Shiftry will be dumping Grass Energy into the discard pile with Leaf Draw, and then Landorus can bring it back with Shout of Power. 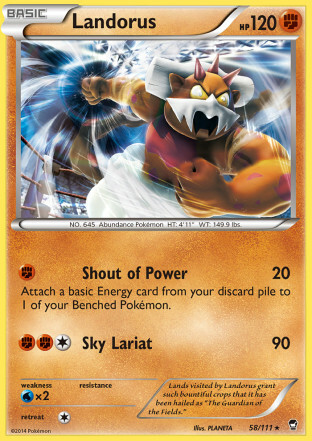 To support Landorus in the deck, I play Strong Energy to get some extra damage out of the Shout of Power attack. With just a single Strong Energy, you’re doing 40 damage, which is great for setting up EX’s into knockout range for Shiftry, even if your opponent is playing a tight bench. Sometimes, some really strong plays come into play with Landorus. For example, against Manectric EX and Darkrai EX, you can hit for weakness and do some really big damage with Landorus. Shout of Power with a Strong Energy and Silver Bangle does 140 damage to them. If you get a second Strong Energy on them, with Silver Bangle you can OHKO them for 180 damage. Sometimes, you just end up in a situation where you can stack Strong Energy onto a single Landorus. If you happen to get three Strong Energy on a Landorus, you can use Sky Lariat for 150 damage, or 180 damage with a Silver Bangle. 1. Can act as a counter to Fighting weak Pokemon. 2. As it has a somewhat high HP of 120, it will often not get knocked out in one turn, so you can setup Energy onto two Shiftry, where as Milotic was always devoting all the Energy to just one Pokemon. 3. It’s setting up damage on your opponent’s Pokemon, making it easier for Shiftry to knock stuff out, while Milotic provided zero support in the damage game. 4. Provides a high HP Pokemon that can serve as a good starter. And that’s the core strategy of the deck as far as the Pokemon are concerned. Shiftry is your main attacker, which you want to be attacking with as much as possible. You should always be filling your bench to the max, to allow Shiftry to hit for a base of 100. While this skeleton only has 6 Basic Pokemon, you will fill out the skeleton with additional Pokemon to fill the bench with. Your opponent will usually have at least two benched Pokemon, and if they have fewer, they are walking a thin line that could easily snap and result in them losing to bench out. If they have two benched Pokemon, Shiftry does 140 damage, enough to knockout all relevant non-EX’s, and then enough to OHKO 170 HP EX’s with Silver Bangle. 180 HP EX’s could present some issues for the deck, but I’m not seeing any right now that I think are going to cause many issues for the deck. Darkrai EX is hard to setup to attack, and doesn’t even OHKO Shiftry. 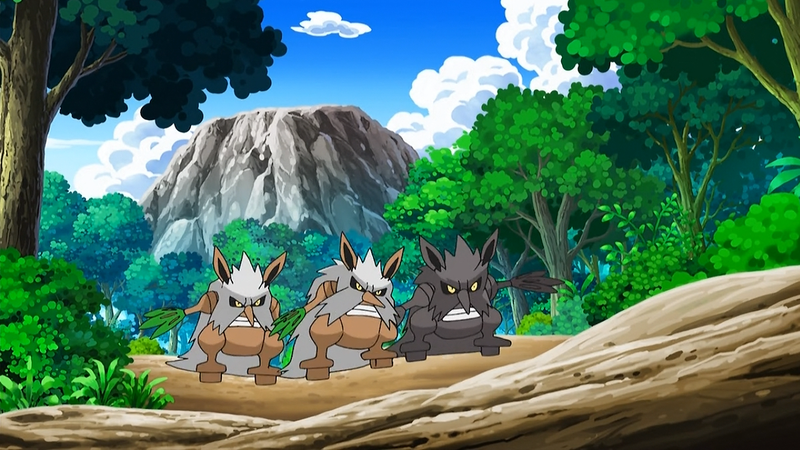 Similarly, Landorus EX and Lucario EX don’t easily OHKO a Shiftry, and if they’re not OHKO’ing you, it’s perfectly fine to trade 2HKO’s when you’re taking two prizes and they’re taking only one. Dialga EX is reliant on Bronzong, so they will generally play with a larger bench, and Seismitoad EX is weak to Grass. The one that could prove difficult is Charizard EX, which can burn up some Shiftry very quickly, but Suicune PLB, which I had in my original Shiftry/Milotic deck, is a simple counter to a Charizard EX. The supporter engine is a little unique, but I think it makes a lot of sense. Professor Juniper and N are maxed out, as they’re your optimal early game Supporters as you want to see as many cards as possible to get setup. Then I include single copies of Colress for a turn of big draw, Korrina to search out Items (I think it’s superior to Skyla in here as it gets you Landorus plus the Item, and if you need a Supporter, VS Seeker should work most of the time), and then Tierno as you can build some big hands with Leaf Draw, and sometimes you might want to draw some more cards but not get rid of your hand. VS Seeker allows you to make great use of 1-of Supporters like this. When you have the VS Seeker in hand, it gives you a lot of control in getting the most out of your Supporter for the turn. 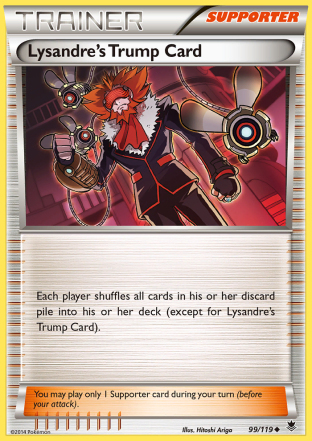 The last touch with the Supporters is a new card, Lysandre’s Trump Card, which lets you shuffle your entire deck except for any Lysandre’s Trump Cards back into your deck. I had started with Sacred Ash, but decided to try this out, and I’ve never looked back. It’s incredibly powerful to be able to get back all of your Shiftry, Rare Candy, and Energy cards into your deck. This deck also does very well in making use of the card because of its additional draw it gets with Leaf Draw. A move that has become all too routine in the test games I’ve played is to use Energy Retrieval for two Grass Energy, then use Lysandre’s Trump Card and then use Leaf Draw twice immediately following the use of Lysandre’s Trump Card. Another nice thing about Lysandre’s Trump Card is that it gives the secondary benefit of disrupting decks like Night March, Bronzong, and Flareon. Next, I want to take a look at what you can do to fill in those last eight card slots to tie the deck together. 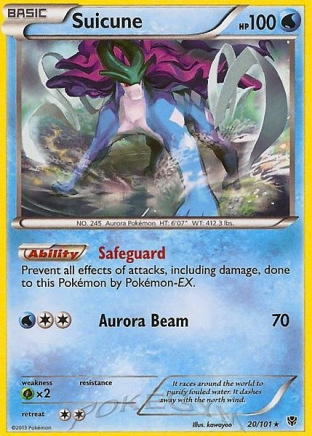 Basic Grass Pokemon – As you are already playing Grass Energy, it’s very easy to slip in some alternative Basic Grass Pokemon into the deck to use in certain situations. Virizion EX is the strongest of these Pokemon, as it gives you its Verdant Wind Ability which shuts off status conditions. If your opponent isn’t able to punish you with Hypnotoxic Laser, Shiftry becomes a lot more difficult to knockout. Virizion EX is also very strong against Seismitoad EX, as it gives you a solid 2HKO on Seismitoad EX, while also resisting the card, and setting something else on your bench with the Energy acceleration. Genesect EX, is then also a strong addition to the deck, as when you use that Emerald Slash, if you can get it onto Genesect EX, all of a sudden you have a Pokemon setup that can OHKO Seismitoad EX, which lets you quickly slash apart Seismitoad EX, the great killer of Stage 2 decks. One of the nice things about this deck is that if a Seismitoad player gets a Head Ringer on Virizion you can just attach a DCE and still use Emerald Slash. I started with 2 Virizion EX/1 Genesect EX, but dropped down to one Virizion EX as I found the two often wasn’t needed. 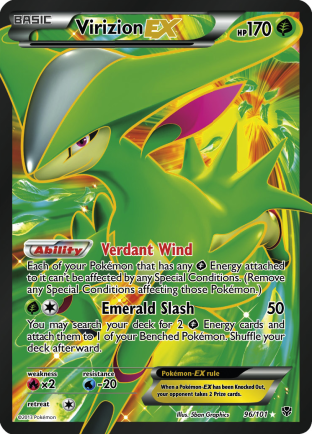 If there is an over representation of Toad in your local meta game, two Virizion EX is probably worth it as anything you can do to improve a popular matchup is always a strong play, but in most normal meta games, one should suffice. I think in general, as long as the Seismitoad player doesn’t get overly lucky with their Crushing Hammers (if it’s that version of Seismitoad), these guys should give you enough to deal with Toad. Off Color Tech Pokemon – This deck can easily support an off color teched Pokemon. I would probably limit it to just one of these, but theoretically you could play more than one. In general, you are looking for stuff that takes 1 of their own Energy, and then a DCE to get setup. The reason you’re so effectively able to get these guys setup, is because you can grab the Energy they need with Professors Letter and also bring it back with Shout of Power to accelerate to that Pokemon. Choosing the right tech can be the difference to losing to a particular matchup in your local meta game and beating it. Mr. Mime PLF – As Seedot doesn’t have a lot of HP, protecting them from taking extra damage while on the bench can be helpful. However, I’m not sure how effective Mime will be in the new format. Landorus EX based Fighting decks seem underwhelming, and there’s enough decks that beat TDK these days that that deck probably is no longer relevant. Manectric EX and Genesect EX could setup knockouts with their snipes, but the deck seems to trade well enough with those decks that I don’t think their bench damage is relevant enough to go ahead and use a spot on Mr. Mime. Miltank FLF – As you’re a Stage 2 deck, Miltank provides a nice option for a one Energy attacker that does a fair amount of damage. 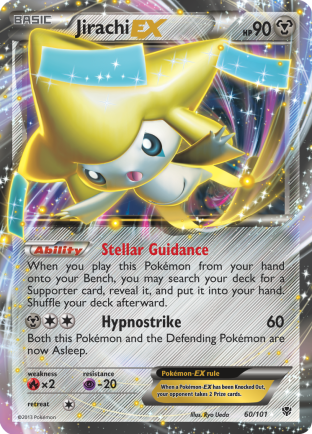 Jirachi EX – This card is always a solid option as it increases the consistency of your deck, turning your Ultra Balls into Supporters. I was already weary of playing this card last format because of the increase in play that Lysandre had seen, turning Jirachi into two easy prizes. With the release of VS Seeker, I don’t think I’d be comfortable playing Jirachi EX in decks anymore, as sometimes it feels like your opponent just can get a Lysandre whenever they need it. Switching Cards – While not entirely needed because the general low retreat costs of most of your deck’s Pokemon, it is still good to play some of these as situations arise where you want to Switch into something else as it’s a more effective attacker. The one thing to note on the Switching cards is that Escape Rope could be a very strong play in this deck as Donphan will surely be a popular deck during City Championships, and Escape Rope gives you an out to getting around your opponent’s Robo Substitute. If Robo Substitute didn’t exist, this deck would easily run over Donphan, however, when you’re wasting turns knocking out Robo Substitute’s for no prizes while your opponent is putting damage on your field you can easily fall behind in the exchange for prizes. You pretty much take a knockout any turn you’re attacking with Shiftry against Donphan, so making sure you’re not wasting attacks on Robo Substitute will allow you to make the game against Donphan much shorter, so Escape Rope is a very strong consideration in the deck over just playing Switch. 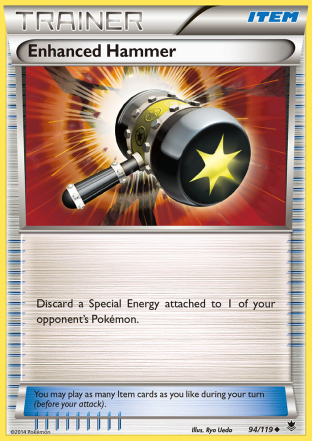 Energy Removal/Denial – Enhanced Hammer is probably the best choice for an Energy removal card if you were to play one. In general, I would shy away from these cards, as you should just be removing your opponent’s Energy from the field by OHKO’ing your opponent’s Pokemon. The cards are still good, as slowing down your opponent some is always good, but ultimately I think the space could be better used elsewhere. Head Ringer could be a solid play to slow down EX decks from being able to attack, but I’m not sure if it’s worth the space in a deck like this as you won’t have a ton of extra room to play a significant count of them, and if you’re not reliably drawing into them, your opponent probably can get a Tool on their Pokemon first. 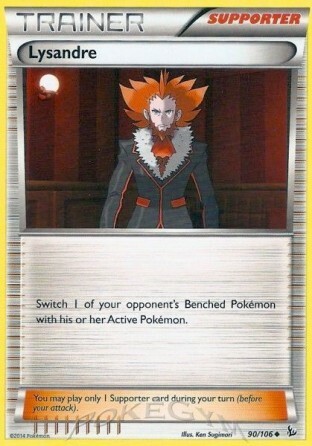 Lysandre – This is generally a good card to play in any deck, as it gives you more control over how the game goes, as you can choose which of your opponent’s Pokemon to knock out to try to force your opponent into as poor of a position for them as possible. 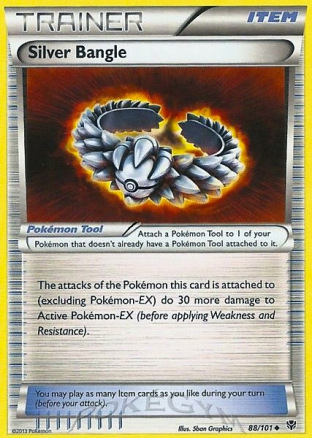 Against EX heavy decks, you can use it to pick off whatever the most threatening Pokemon to you is, or to bring up something you previously damaged that your opponent is trying to hide on the bench. Once again, it is good against Donphan for not only avoiding the dreaded knockout on Robo Substitute, but also for hunting down their Donphan to deny them Wreck OHKO’s and to hopefully make them lose turns of attacking if they can’t get another Donphan setup. One of the nice things about this deck is that you can essentially use Lysandre, while still getting a Supporter’s worth of draw done in the same turn with Leaf Draw. 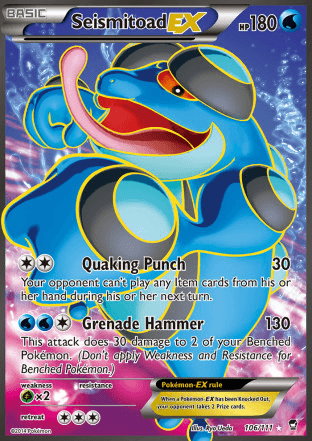 Startling Megaphone/Xerosic – These are two options that you might want to turn back on your Abilities against Garbodor decks. I’m not sure how the meta will pan out entirely, but I think Garbodor will mostly just be paired with Seismitoad EX, so if you’re choosing one of these, Xerosic would probably be what’s needed. Megaphone may be worthwhile over Xerosic if Tool Drop becomes big in your meta game, however. Training Center – This is a really interesting play in this deck, as it turns Shiftry into a 170 HP monster. My fear would be space limitations preventing your from playing a high enough count to get this to stick on the field, but getting Shiftry up to 170 HP almost guarantees that your opponent will 2HKO it. 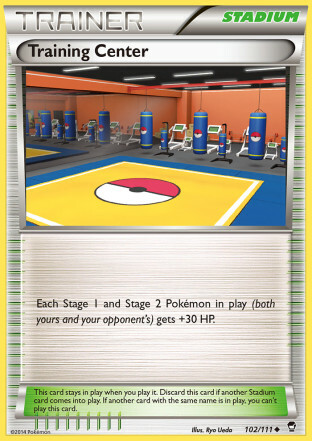 What’s really nice about that as well, is Stage 1’s generally have a lower HP (Donphan getting up to 160 with this card would be the highest) and play with larger benches, that it shouldn’t be too hard to get to the 160 damage mark (3 Pokemon on your opponent’s bench), while keeping your opponent to 2HKO’s. This could be a very strong play in the deck. I’ll need to test this one more, and mess around with higher counts of the card, as it does seem very powerful, but I haven’t tested this enough to give a determinate answer on this card’s effectiveness. I haven’t tested it yet because I generally dislike cards that my opponent can control the effectiveness of the strategy, but it almost seems like it could be too good to pass up. More Supporters/VS Seeker/Energy/Landorus/Energy Retrieval – Then the last thing you can do to fill out the Skeleton is to take stuff that is already in the Skeleton list and bulk up their counts for consistency purposes. In some metas, just boosting consistency with some of the extra spots may make the most sense, while in others, teching the deck out more will make more sense. Now before I get into my specific list that I am currently using for the deck, I want to stress to work off the skeleton, and fine tune the deck for your specific meta game. While this is what I’m using right now, this is what I’ve built for a blind meta game for general testing purposes. If I were to play the deck at a tournament, I would examine my local meta game more closely, and figure out what final 8 cards would make the most impact, and not necessarily play this exact list. Nonetheless, this list does provide a good sample on how the deck can be tied together as a whole. The main special thing I included in this deck with the additional slots is add Suicune with a Water Energy to give the deck a Basic alternate attacker that can deal with an opponent’s Charizard EX, while also being good against Fighting decks in general. A single Suicune is insanely strong against Fighting decks. I put in 1/1 of Virizion EX and Genesect EX to give me a Basic Pokemon game plan against Seismitoad EX while getting the additional benefit of Verdant Wind. Against anything not including Seismitoad EX, I generally don’t use these Pokemon to attack, but they’re still useful in that they fill the bench. Then I added Lysandre to give me the option to gust something up, and it is also reusable with Dowsing Machine and VS Seeker (and then Lysandres Trump Card as well!). I put in Escape Rope for Switching options, opting for just two of those instead of some kind of a split as I expect Donphan to be very popular. And then I put in a Fighting so I have a searchable, retrievable Energy to use in conjunction with Landorus. I chose not to tech for Garbodor, as I don’t expect it to see a ton of play outside of Seismitoad EX, which you just use your other answers against. While Leaf Draw is a great boon to the deck, I think the deck functions fine enough without it that it can deal with the few Garbodor decks in the meta game without relying on Startling Megaphone. If Garbodor is a big enough problem that you don’t want the Ability lock active, you can just Lysandre up the Garbodor and knock it out, and shutoff Abilities that way. For a deck that started as a pet deck that I was just toying around with casually, I’m very happy for how strong this deck has turned out to be. Shiftry is an undeniably powerful card in its ability to take OHKO’s while only giving up one prize card when your opponent knocks it out. This is particularly strong with Shiftry’s relatively high HP of 140 HP, which often turns it into 2HKO’s. Anything that is a 2HKO for your opponent, that OHKO’s back, while also only giving up only one prize will always have the potential to be the basis for a very strong deck. While Stage 2 decks have suffered greatly since the release of Seismitoad EX, Shiftry’s typing puts it in a unique position to be able to survive in the a Toad world. The deck has proved in my testing to be able to deal really well with EX heavy strategies, while also having solid results against non-EX strategies such as Donphan and Night March. The deck’s biggest enemy is probably itself, as sometimes Stage 2 decks just don’t get setup. That leaves some days where you will run well with it, and do well, and other days where you just get unusable hands in the early game and lose as a result. I think Leaf Draw really helps to limit this for Shiftry compared to other Stage 2 decks however, so I think it should be more consistent in its setup than Stage 2 decks generally are. This is a deck that you should definitely add to your list of decks to test for City Championships this year. It’s very powerful, and in the right meta, with the right deck list its a deck that definitely can do well! I played Shiftry/Milotic at US Nationals, and had multiple opponents reading my Shiftry asking what it did. Despite not ending out very well, it was a really fun deck. Glad to see that Shiftry is seeing a bit of light. Fixed it. 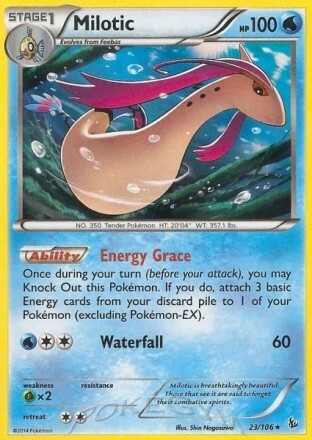 60th card is Water Energy for Suicune. Hopefully everyone that’s been putting this together to play online and stuff figured that out! Against the Night March variants I’ve played, I’ve generally been able to beat the straight versions, but the ones that mix it together with Flareon have been too difficult to beat because of the weakness. Beating Night March comes down to a lot of uncontrollable factors though. Just a matter of whether they draw out of and get stuff back in the discard after you use Trump Card or not. I actually beat a really good player at a league tournament here using Donphan. If you get a decent paced setup, I think you can beat it if you can stick the Lysandre at the right time on the Donphans. Otherwise, if you don’t get setup, you just fall too far behind as they’ll be taking a prize every turn, and then they may be able to Lysandre some cheap prizes up to finish the game off, and you’ll always lose some turns to Robo Substitute. Being a 2HKO except when they wreck is nice though. 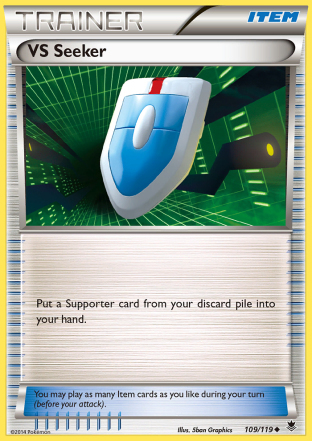 Tried this out on PTCGO. Beat two weird things and a Virgen before losing to another Virgen because I misplayed Bangle. Your last list has a typo in it, it lists one fighting energy where I think you wanted to make that a water energy. Great article as always, I love hearing the rogue side of deckbuilding.